AR (mobile AR, smartglasses) could approach three and a half billion installed base and $85 billion to $90 billion revenue within five years. At the same time, VR (mobile, standalone, console, PC) might deliver 50 million to 60 million installed base and $10 billion to $15 billion. That’s a pretty big difference, and it all has to do with AR’s ubiquity and VR’s focus. 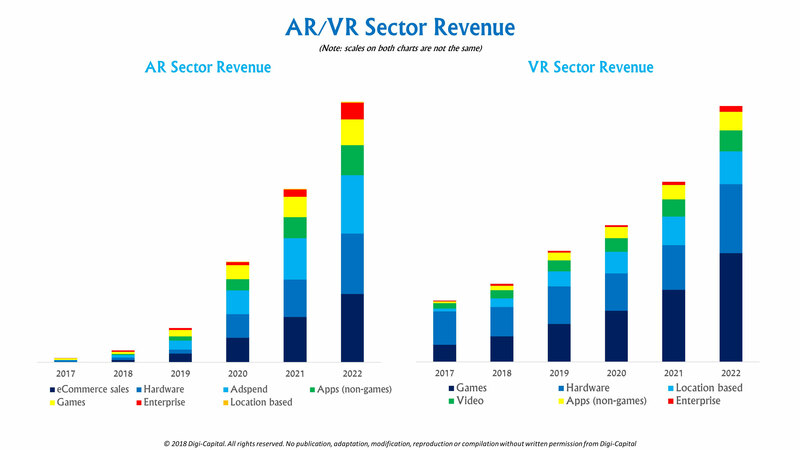 (Note: Digi-Capital’s base case is that even with 900 million installed base for ARKit/ARCore by the end of this year, AR/VR revenue won’t begin to scale until 2019). 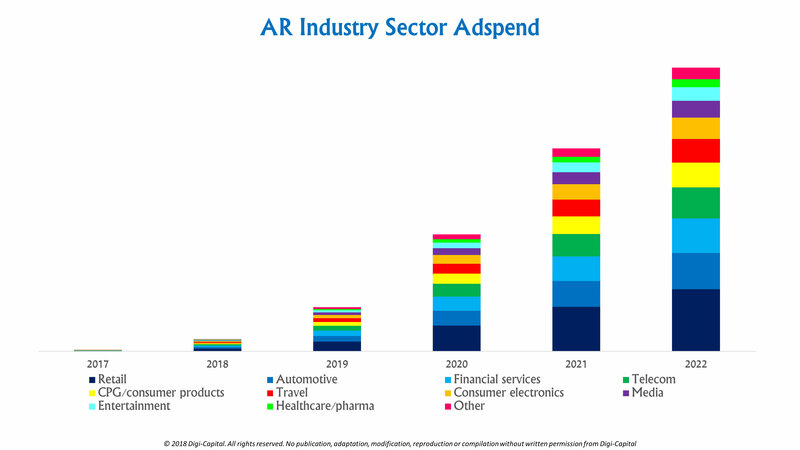 To understand why the sister markets are shaping up so differently, we’re going to dig in to AR’s and VR’s installed bases, use cases, app store category revenues (IAP/premium), e-commerce category sales, adspend by industry, enterprise revenues by industry and geographic splits. The devil’s in the detail, and this is the most detailed dive we’ve ever done. Mobile AR (Apple ARKit, Google ARCore, Facebook Camera Effects, Snap Lens Studio) could hit 900 million installed base by the end of this year, approach three and a half billion by 2022 and dominate AR/VR for the foreseeable future. Yet while VR’s market potential was diminished by the emergence of mobile AR as a rival platform last year, saying “this VR cycle is dead” might be a little harsh. 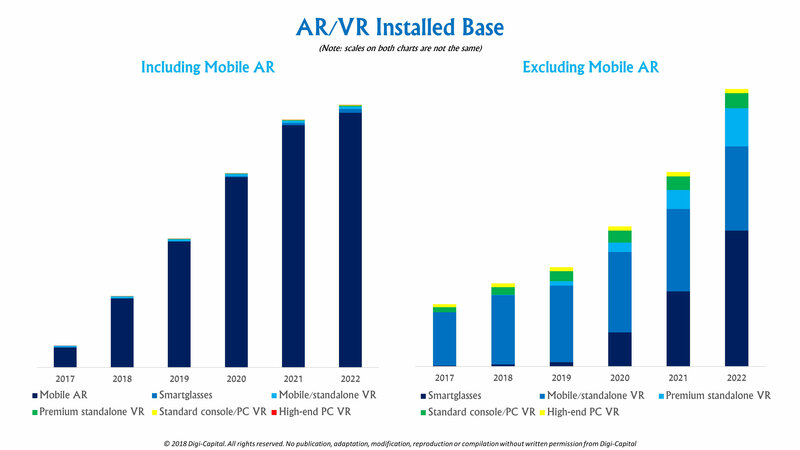 Standalone premium VR (neither PC nor mobile tethered, like HTC Vive Focus and Oculus Santa Cruz prototype) could begin to accelerate in 2019/2020 as hardware/software develops and prices come down, but might only deliver around half of mobile/standalone VR’s installed base by 2022. Console/PC VR (HTC Vive, Oculus Rift, Microsoft Windows Mixed Reality, Sony PlayStation VR) could grow from today’s low single-digit millions, but might only be in the high single-digit millions in five years’ time. Smartglasses (Magic Leap, Microsoft HoloLens, ODG, Meta, Vuzix) remain the long-term future of AR/VR. If Apple launches smartphone tethered smartglasses in 2020, the smartglasses market could grow from a few hundred thousand enterprise users last year to several tens of millions of mass-consumers by 2022. 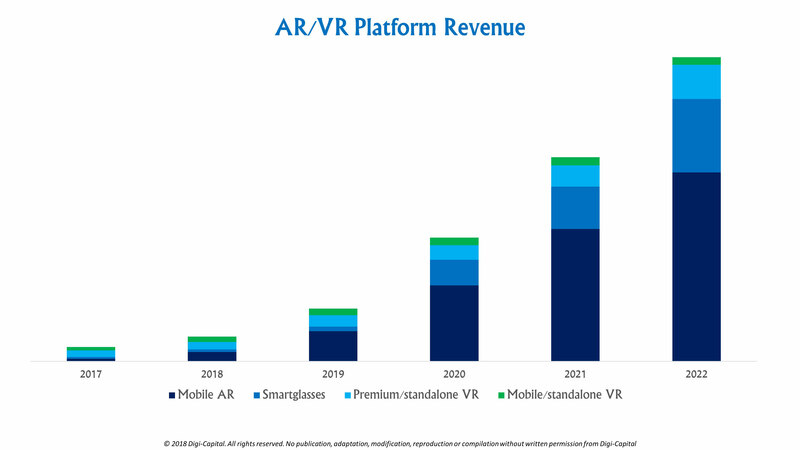 All told, the combined AR/VR headset market could reach an installed base in the high tens of millions to more than 100 million by 2022 (or around 3 percent of mobile AR). Mobile AR apps in their first few months were largely ports from existing platforms, but AR’s coming scale, flexibility, mobility and ubiquity are driving an explosion of new use cases and business models. E-commerce sales (goods & services, not IAP) could become the largest revenue driver for AR, where Houzz has proven mobile AR can increase sales conversion rates by 11x, and Alibaba has partnered with Starbucks for the world’s largest AR enabled Starbucks Roastery in Shanghai (Alibaba is a leading investor in Magic Leap for a reason). If and when Apple launches smartphone-tethered smartglasses, hardware sales could become AR’s second largest revenue stream. Adspend driven by mobile AR’s scale comes next, followed by app store revenues from a diversity of new non-games’ IAP/premium revenues and more familiar games’ business models. Enterprise AR could be significant for both future developments of today’s enterprise-focused smartglasses and mobile AR. Lastly, location-based AR entertainment could deliver long-term. VR’s smaller installed base, lower mobility and exclusive immersion (i.e. limited plurality) focuses it on entertainment use cases and revenue streams. Entertainment (games, location-based entertainment and video) could take two-thirds of all VR sector revenue long-term, with hardware taking just over a quarter due to limited unit sales and price competition. There will be enterprise use-cases, but VR’s relatively lower installed base and form factor could see much lower corporate spending than equivalent enterprise mobile AR and smartglasses. VR e-commerce and advertising revenues could develop, but the scale and fragmentation of VR’s user base limit their significance for now. The differences between the two markets become clearer when looking at the 23 app store revenue (IAP/premium) categories. While AR games could take more than two-thirds of AR app store revenue this year (no other category taking more than a few percent), a Cambrian explosion of creativity by developers and investment by VCs could see 20-plus non-games sectors drive over half of AR app store revenue by 2022. Games should remain significant, but the greatest innovation and growth could come from sectors from social to navigation and beyond. Totally new use cases could give rise to new business models, disrupting sectors both old and new. 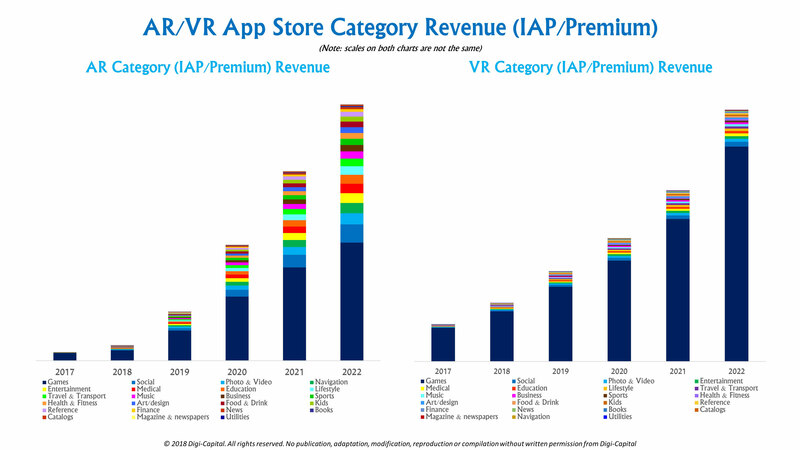 In contrast, games might take the bulk of VR app store revenues long-term. VR looks most like a subset of the video games market, where it has been heavily marketed toward a gamer user base. As above, emerging AR e-commerce has already proven its worth to market leaders. But the potential extends far beyond lifestyle retailers like Houzz. 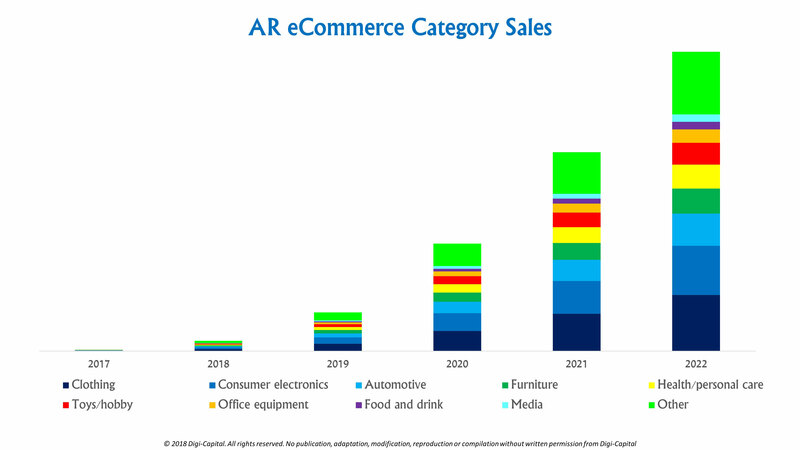 The biggest AR e-commerce sales could come from clothing, consumer electronics, automotive, furniture, health/personal care, toys/hobby, office equipment, food/drink and media categories. While new players will emerge to leverage e-commerce’s AR potential, current e-commerce giants like Amazon, eBay and Alibaba could see the greatest benefit from more immersive AR sales techniques. The massive installed base coming for mobile AR could be a boon for Facebook (Messenger, WhatsApp, Instagram), Snap (Snapchat, Bitmoji), Tencent (WeChat, QQ) and other social/messaging platforms. Snap’s Dancing Hotdog pointed to where the company is heading in terms of advertising, and mobile advertising’s 88 percent of total adspend on Facebook meant that Mark Zuckerberg’s Camera Effects platform was always going to happen. Major brands could take a little time to fully understand mobile AR’s potential, but when they do, expect to see significant adspend from retail, automotive, financial services, telecom, CPG/consumer products, travel, consumer electronics, media, entertainment and healthcare/pharma advertisers. Smartglasses have been enterprise-focused to date, as corporate users’ ROI from cost savings allows them to invest in pilot projects. Companies like Microsoft, ODG, Meta and Vuzix are seeing early enterprise traction, although the enterprise smartglasses market remains early-stage. Mobile AR’s ubiquity and low cost could also help enterprise AR adoption from this year. 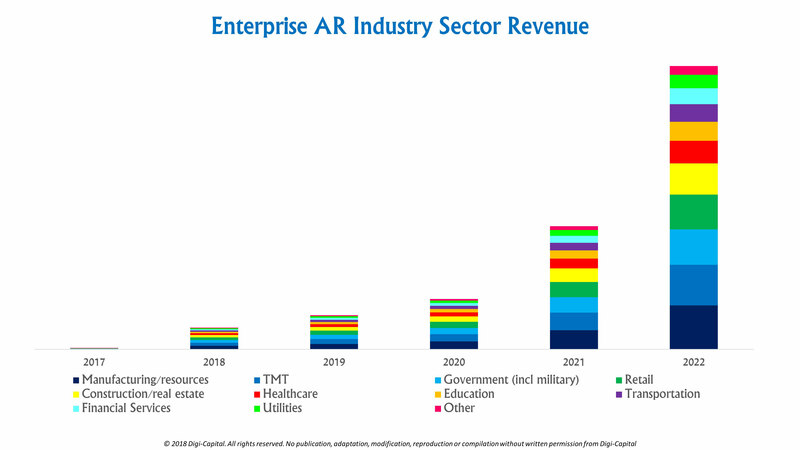 Together with new generations of smartglasses, enterprise AR could see steady growth until it hits an inflection point around 2021 across manufacturing/resources, TMT, government (including military), retail, construction/real estate, healthcare, education, transportation, financial services and utilities industries. 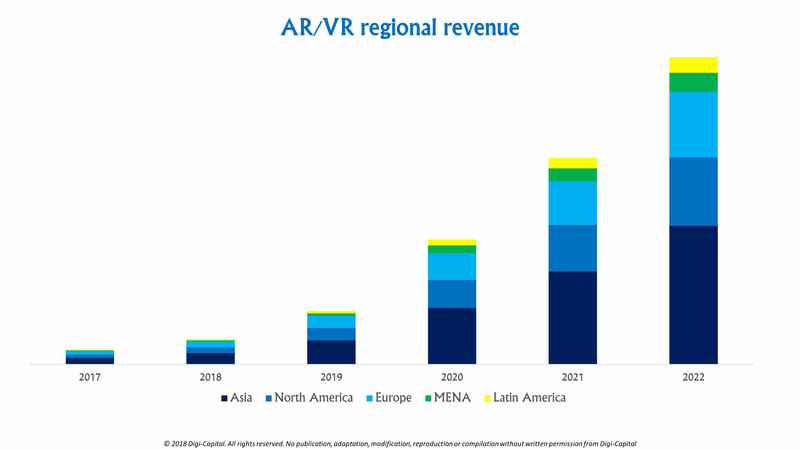 With mobile AR’s geographic distribution broadly similar to current smartphone/tablet distribution, and VR’s distribution broadly similar to current games’ market distribution, AR/VR revenue could be dominated by Asia (particularly China, Japan and South Korea). This could see Asia roughly equal in size to North America and Europe, combined. As smartglasses’ early consumer revenue could come from mobile tethered smartglasses, its revenues might follow a similar geographic pattern. We’ve also said that AR/VR is the fourth wave of consumer technology, and that AR could be bigger than VR. That looks like how things might pan out, but we’re still only at the start of what that wave could become — 2018 isn’t the “year of AR/VR” yet. While fellow surfers know that picking (and riding) big waves isn’t without risk, when you get it right, there’s little better. So for the patient and brave, it’s going to be a wild ride.